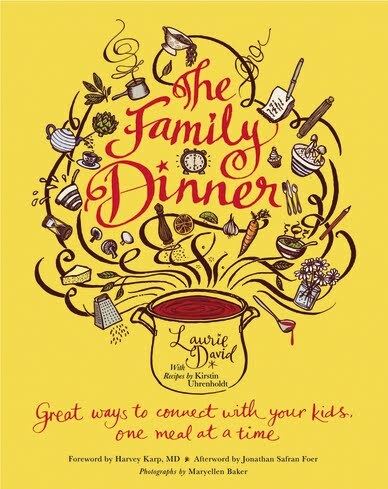 "The producer of An Inconvenient Truth, Laurie David's new mission is to help America's overwhelmed families sit down to a Family Dinner, and she provides all the reasons, recipes and fun tools to do so. Laurie David speaks from her own experience confronting the challenges of raising two teenage girls. Today's parents have lots to deal with and technology is making their job harder than ever. Research has proven that everything we worry about as parents--from drugs to alcohol, promiscuity, to obesity, academic achievement and just good old nutrition--can all be improved by the simple act of eating and talking together around the table. Laurie has written a practical, inspirational, fun (and, of course, green) guide to the most important hour in any parent's day. Chock-full chapters include: Over seventy-five kid approved fantastic recipes; tips on teaching green values; conversation starters; games to play to help even the shyest family member become engaged; ways to express gratitude; the family dinner after divorce (hint: keep eating together) and much more. Filled with moving memories and advice from the country's experts and teachers, this book will get everyone away from electronic screens and back to the dinner table." What we thought: This is a really unique cookbook in that it not only has family-friendly recipes, but great tips on how to make the family dinner a nightly tradition in your home. In this day and age, it is actually a rare occurrence that the entire family sits down together every night to share a meals and talk face-to-face. This book is full of great tips for healthy family living and eating. If you are ready to begin establishing routine dinners with your family, this book is the perfect place to start:) ABCD Diaries gives The Family Dinner an A+! Buy It: Find The Family Dinner at your favorite book seller! 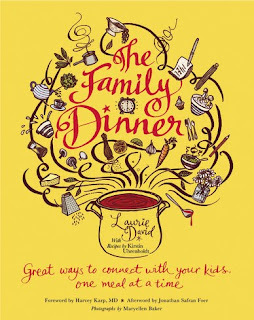 Win It: Hatchette Book Group has generously offered one ABCD Diaries reader a copy of The Family Dinner! To enter, leave a comment below! Collect cookbooks, would love to win. I entered the Lindsay Olive giveaway! I'd love to add this cookbook to my collection. I entered Mrs. Cubbison's Gift pack. We would love to win this. Thank you or entering us in the giveaway! Also entered the Alphasquiggle giveaway. Also entered the Little Green Books giveaway. Entered the personalized ornament giveaway. I'd love to win a copy of this cookbook. I need some inspiration! I'd love to add this useful cookbook to my collection. This sounds like a cookbook that I'd love. I entered the Hershey's Stocking Candy giveaway. I think this book is a magnificent idea! I love cookbooks! This sounds like a great one! I'm a 1st time mom of a 14 month old little girl & am currently going back to school for my Culinary Arts degree. I LOVE cooking & baking & I can't wait for the day that I can have my daughter in the kitchen helping me. I collect cookbooks & it would be awesome to be able to add this to my collection. Nice giveaway!! I entered the Dewey's 9 lives book giveaway! !